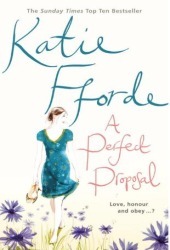 I read this last night, a very light, romantic fun read. The character of Sophie Apperly is a protagonist that anyone who has ever felt unappreciated will root for. She is the nice girl who grew up being overlooked in a family that didn’t value her talents and skills. I loved the fact that she is independent and so capable of dealing with everything that is thrown at her. The older characters, Matilda and Evil Uncle Eric are charming and lovable. The plot takes the reader from England to New York to Connecticut and back to England. The romantic trials of Sophie and Luke are full of two steps forward and one step back type incidents and of course meddling matchmakers. Intertwined parts of the plot include inherited oil drilling rights and a “missing” house in Cornwall. Everything comes together in the end for a satisfyingly happy ending. Lovely romantic “feel good” book. I do enjoy light romance with a bit of adventure and good settings and writing! Yes, so do I, but the main character has to have something going for her. That is what I like about Katie Fforde’s romantic leads, you feel like you would want to be friends with her characters.